Luis Pérez Freire was born in Marin, Pontevedra, in 1980. 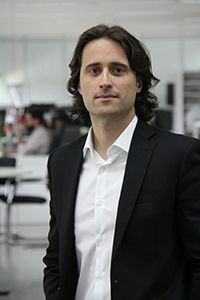 He received his degree in Telecommunications Engineering and PhD in Telecommunications from the University of Vigo in 2003 and 2008 respectively, a period in which he was associate researcher in the Signal Processing in Communications Group (CSPM) of the Signal and Communications Theory Department of the same University. In 2006 he was awarded a postgraduate scholarship from Caixa Galicia Foundation which conducted to a research stay on Digital Watermarking in the Electrical and Computer Engineering Department of the University of Illinois at Urbana-Champaign, USA. In 2008 he was a postdoctoral researcher in the Security Labs of Thomson R&D (now Technicolor) in Rennes, France, developing protection technologies for the multimedia industry. His research lines have focused on watermarking, security and multimedia processing, areas on which he has published numerous articles in journals and prestigious international conferences, and in which has several patents. His research career has been recognized on several occasions: in 2007, received in Saint-Malo, France, the Young Author Best Paper Award of Information Hiding Workshop (IH’07); in 2009 he received the COIT/AEIT Award for Best Doctoral Thesis in Management, Economics and Regulation of Telecommunications, and in 2011 was nominated by the Information Forensics and Security Technical Committee to IEEE Signal Processing Society Young Author Best Paper Award. Luis is an usual reviewer and member of the Technical Committee of leading journals and scientific conferences in his area, such as IEEE Transactions on Information Forensics and Security, IEEE ICASSP, ICIP, etc. Luis has participated since 2004 in numerous R&D projects in the areas of multimedia security, emphasizing his experience as technical coordinator and project coordinator in the Seventh Framework Programme (FP7), and its many partnerships with the industry to develop technology transfer projects. In 2009 Luis joined Gradiant to promote the creation and the consolidation of a new technical area in the field of multimedia security and processing (Multimodal Information Area). Since 2011 he held the role of Technical Director of that Area until 2014, when he was appointed Innovation Director. Since 2015, Luis is Gradiant’s Executive Director.